Telluride, CO sits in a little box canyon at 8,800ft, fed by the headwater of the San Miguel River and surrounded by more than a dozen 13ers. In its first incarnation it was a bustling mining town, named for the element Tellurium which oddly was one of the few elements not found in the mining rich area. After a decade things began to sour though the town eked out a living until the 1970s when the last of the mining conglomerates closed shop, removing whatever was valuable to greener pastures and leaving behind a number of heavy metal toxic cesspools that are still there today. Telluride got a second lease on life when the Forest Service approved the Telluride Ski Area, transforming the town in a few short years to a destination ski resort. Though not quite on par with the likes of Aspen or Vail, the longtime residents are quick to tell you it's well on its way, taking the townsfolk kicking and screaming with it. I had been to Telluride to ski almost 30yrs ago, and while the town was quite fun and interesting (I sort of remember a few drunken nights with dancing on the bar and other forms of revelry), the skiing left something to be desired because the snowfall in this part of the state is not all that plentiful most years. Summer would be something new altogether. Eric had sent Steve and I each a Telluride hiking book some nine months earlier, his way of asking us if we'd like to vacation in Telluride with him. The three of us have been friends since we graduated from different universities and all came to work for the same semiconductor company in Silicon Valley. Eric has since moved to Albuquerque, NM, but we've stayed in touch, Steve and I almost weekly. Eric owned a few rooms at the Telluride Hotel and invited us to stay there for the week. We both readily agreed. I had spent the last week driving to Colorado while Steve flew to New Mexico and drove with Eric to Telluride. Eric had brought his dog Leroy along for the fun, one of the most good-natured canines I've had the pleasure to encounter. Leroy was used to hiking - alot - and would run circles around us up and down the trail for mile after mile without seeming to ever tire. On our first full day in twon, the four of us set off on a Tuesday morning hike under bright blue skies, the nicest weather I'd seen in some time. Our plan was to do the See Forever/Wasatch/Bear Creek loop south of town as featured in the book Eric had sent us (Anne and Mike Poe's Southwest Colorado Day Hikes - Telluride has far more details than I care for in a guidebook and very short on actual summits). The first order of business was to take the free Telluride Gondola from the south side of town up to Coonskin Mtn, a rise of 1,800ft that would save us some sweat. Every third or fourth gondola car is marked as dog-friendly which is pretty characteristic of this rather dog-friendly town. In only 15min we were at the start of the See Forever Trail, essentially the long North Ridge descending from Gold Hill on the east side of the ski area. Once off his leash, Leroy bounded off in one direction and then another, taking in as much territory as he could manage before returning to us with a questioning look of the sort, "What's keeping you?!" The "trail" itself is little more than the maintenance road for the ski resort with some sections of single track, but mostly just a gravel/dirt road. The views make up for this shortfall however with scenes unheard of in California. Green alpine meadows abounding in flowers covered miles of the slopes above treeline. Mt. Sneffels and a host of high 13ers could be seen across the valley to the north, the Wilson Group with another 3 14ers prominent to the southwest. We passed by the nouveau rustic Wine Bar (closed in summer, darn it), took in the views to Bear Creek Basin and chatted casually while hiking along at an unhurried pace (I have several gears, for those that might find this impossible to believe). All the while, Leroy covered four or five times the distance as the rest of us. After an hour and half's time we reached the junction with the Wasatch Connector which would take us down to Bear Creek Basin on the left. By now I was itching to get to the top of something so I announced my intention to continue on the ridge to Gold Hill and points further south. I asked if the others might want to join me to Gold Hill but they declined, all except Leroy who happily followed me even after leaving Eric and Steve. When I found him still in tow I had to send him back to the others, causing Leroy some concern. As a pack animal he prefers to keep the group together, but when we split up he found this disconcerting, wanting me to go back with him to keep the pack together. He would have to get used this different sort of outing over the week. Gold Hill rises just above the highest chairlift at Telluride, a gently rounded summit of no great consequence, more of a local highpoint on a ridge leading south to higher summits. Of interest here are the expert chutes and couloirs off the west side of the ridgeline, available to skiers in wintertime - if one is willing to walk. From the highest chair, one can walk uphill along the ridge to drop into any of the entrance points, Gold Hill Nos. 1-10. The last three are particularly steep, a stairway having been built to access these hard-to-reach couloirs. Beyond these is the ski area boundary and what I hoped would be a continuing ridge traverse to Palmyra Peak. It started off well enough, but soon devolved into something beyond class 3. Cliffs permeate the east side and the direct ridge access, making Palmyra far harder than I had imagined (btw, Palmyra Peak is named for the Palmyra Mine on the west side, which in turn was named for the ancient city of Palmyra, Syria, which was recently bulldozed by IS as against Islam - and so the world turns...). I had hoped to visit Palmyra and then Silver Mtn to the south before turning east and following the ridge of 13ers in that direction. This rebuff on Palmyra required a new plan. After a visual study of the possible routes to the south, I decided to drop down into Lena Basin and climb to San Joaquin Ridge through what looked like a class 2 route through the cliffs on the north side of the ridge. As I descended into Lena Basin I spooked a small herd of maybe 5-6 deer including a buck with fuzzy antlers. There is much green sprinkled with a million yellow flowers in the basin, a picturesque scene amidst steep talus slopes and rocky cliffs that ring the basin. The route up to San Joquin Ridge proved no harder than class 2 as hoped, though perhaps more tedious than one might like due to much loose talus. The summit of San Joaquin Ridge lies above 13,400ft, higher than Palmyra, but just shy of Silver Mtn, now to the west. A two-page register dating to 2009 suggests only a couple of visitors each year. It has a wonderful view of the next major canyon to the south at whose base lies the small town of Ophir. Now 12:30p, I would spend the next hour traversing the ridge east to Oscar Peak along much scree, all of it class 2 if you bypass the few places with more difficult terrain on the south side. Oscar Peak gives the first good view into Bridal Veil Basin to the east. There are two trail passes near Oscar - Oscars Pass at a saddle to the east and McCarron Pass to the north. The latter connects Bear Creek to Bridal Veil Basin, while the former connects Ophir to Bridal Veil. A CMC register from 2011 suggests Oscars is fairly popular, not surprising considering its location near two hiking passes. I turned north and dropped to McCarron Pass/Junction, marked by a rusted iron sign complete with its own PVC register container. The route continuing north is part of the Seven Summits Trail, an informal route crossing the divide between Bear Creek and Bridal Veil Basin. Two of the summits lack sufficient prominence, but what's a few hundred feet among friends? I went over the two minor summits on my way to the highpoint of the day, Wasatch Mtn at over 13,500ft. 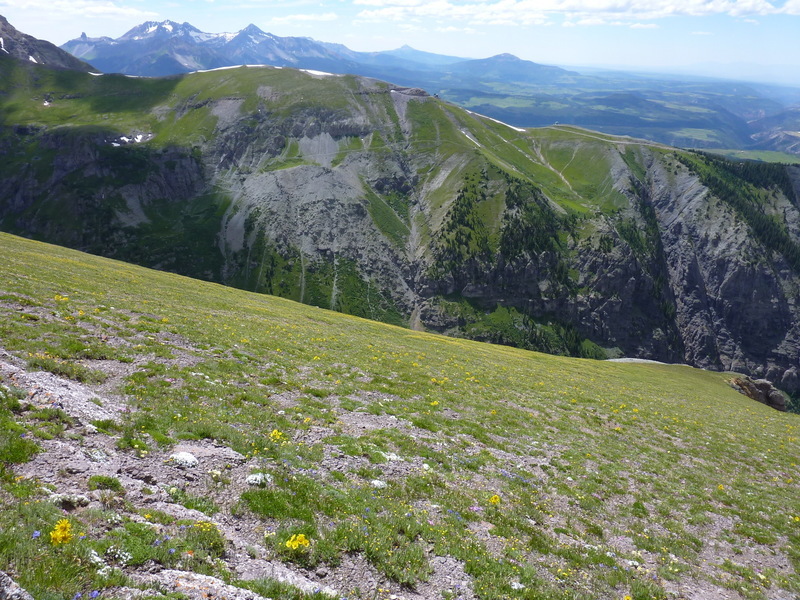 Rather than continue on the Seven Summits path which would take me next to La Junta Peak, I followed the Northwest Ridge to informally named Little Wasatch Mtn just above the Wasatch Mine in La Junta Basin. The whole route from Oscar to Little Wasatch was class 2 and a most enjoyable traverse. Now 3p, I was out of summits along the route I pursued and not really sure how I was going to get back to Telluride. I noted a road that could be seen descending La Junta Basin, but the map and GPSr showed the road ending above a cliff section, likely at an old mining site. I wasn't sure if I could descend from La Junta Basin to Bear Creek, but thought it worth a try. I descended steep, green slopes into La Junta Basin, stopping at one point to take in the scenic fields of flowers I was romping through. I found some old mine relics in the bottom of La Junta Basin and continued down to pick up the road near its terminus, which as expected, was the site of an old mine. Exploring further, I found an old trail descending from the mine site. A few days later I would discover this is one of the unmaintained gems of the area called the La Junta Trail. A bit overgrown in the upper reaches, it descends through brush through the cliff bands, then down a large talus field where a section has been washed away. Eventually it reaches the ruins of a large mine complex with an old road descending down to Bear Creek. Part of this road was cut along cliffs and actually into the cliff at one point, much like the road out of Ouray to Yankee Boy Basin. The road becomes a trail again lower down, switchbacking down steep, forested slopes before ending at Bear Creek. A convenient log allowed access to the west side where one can then pick put the Wasatch Trail and take this back to Telluride - a most convenient find!